It may be summer here, but in southern Africa, Lesotho to be exact, it’s rather chilly right now. My friend Megan is a physician there, and to warm her up, I sent her this scarf. It started out life as a thrifted Banana Republic sweater in a dingy blue-grey color. 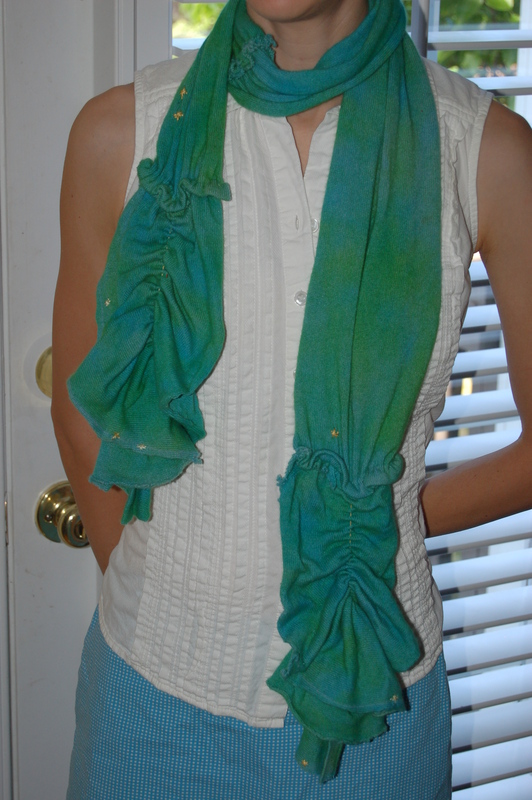 I felted it (didn’t shrink much), dyed it greenish-blueish aqua with kool-aid, cut it into strips, and sewed it into a gathered scarf. I embroidered over the little bitty holes in it, too. See my other cashmere scarf post for more detail. For information on dyeing cashmere, see this post. For information about overdyeing, click here. This entry was posted in Crafts, Fiber Arts, Sewing and tagged cashmere, craft, dye, dyeing, felted sweater, handmade, kool-aid dye, overdyeing, scarf, sewing by Emily Smith Pearce. Bookmark the permalink.